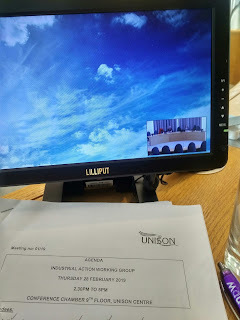 This afternoon I chaired a meeting of a UNISON working group on industrial action at our headquarters in Euston, London (with an NEC member from the West Midlands video conference into the meeting). While taking industrial action (strikes, overtimes bans, working to rule etc) is nearly always a last resort, we need to ensure that when we do take action and our members can lose money by being on strike, that we have an impact and that we can win the dispute for members. I have very limited patience for those who advocate "glorious defeats" for our members. I recognise that we do need to take risks in disputes and I have been on a number of "risky" strikes, some very successful, some ill conceived disasters. 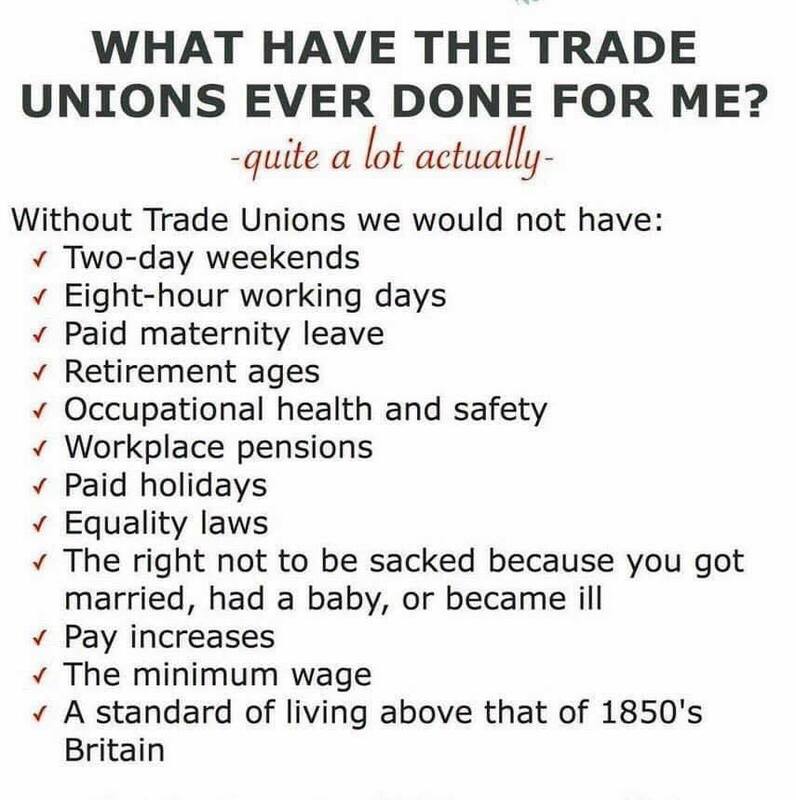 In light that most of our members being very low paid (but no-one wants to lose money unnecessary) and Tory Government anti trade union legislation, we need to box clever and make sure when we have a fight with employers or the government, we not only have an effective union machine to support members and win, we also have the support of our members that this is a issue that is important to them and a plan to win. There were a number of really positive ideas and proposals to come out of this working group. Watch this space. On Monday evening I went to the launch of the "Newham Word Festival" with the Mayor Rokhsana Fiaz and my fellow Deputy Mayor Charlene McLean. It was a lovely launch and great to meet lots of Newham residents who are so passionate about literature, art and culture. "Poetry, film, storytelling, authors discussing their books, visual arts, debates, performances and lots more. 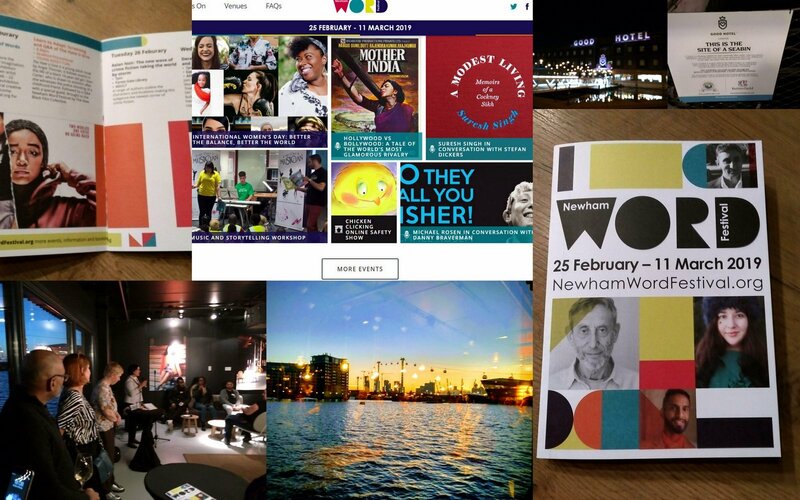 Featuring artists from near and far, local and international, at the peak of their careers or just starting out, Newham Word Festival takes place across the whole borough". Many thanks for all the branches that have supported us. 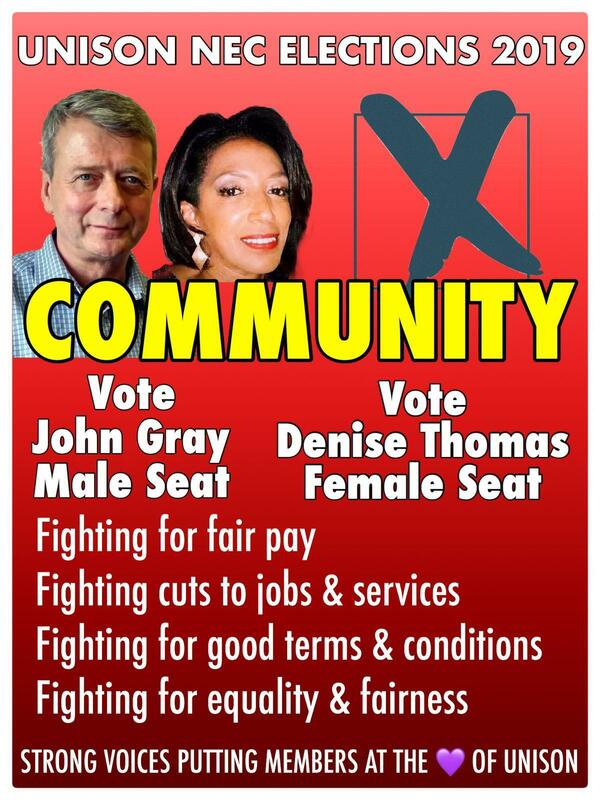 If all goes well and we are accepted as candidates voting will start on 15 April (ballot papers sent to home addresses of members). 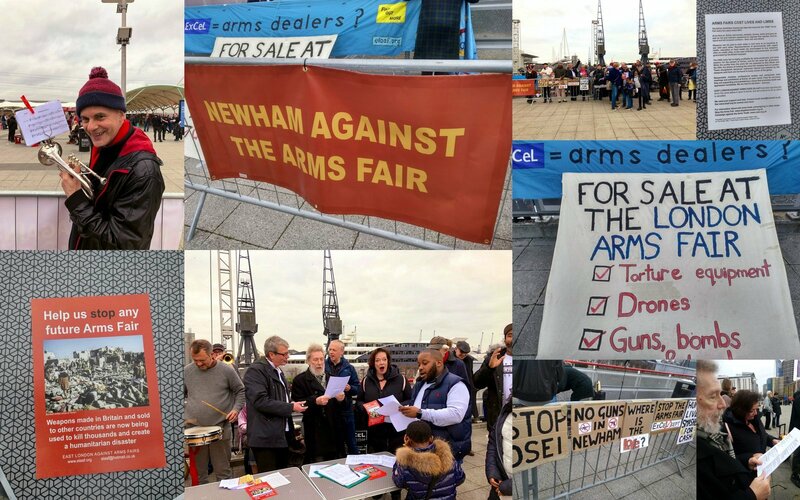 This picture collage is from the protest last Saturday 16 Feb at the Excel Centre against plans to hold the biannual DSEI (Defence & Security Equipment International) Arms fair in September. The Newham Executive Mayor, Rokhsana Fiaz and local MP, Lyn Brown turned up to support protestors as did many local Councillors. It was a largely a friendly musical protest apart from some "disagreements" with Excel security about handing out leaflets and where to stand. 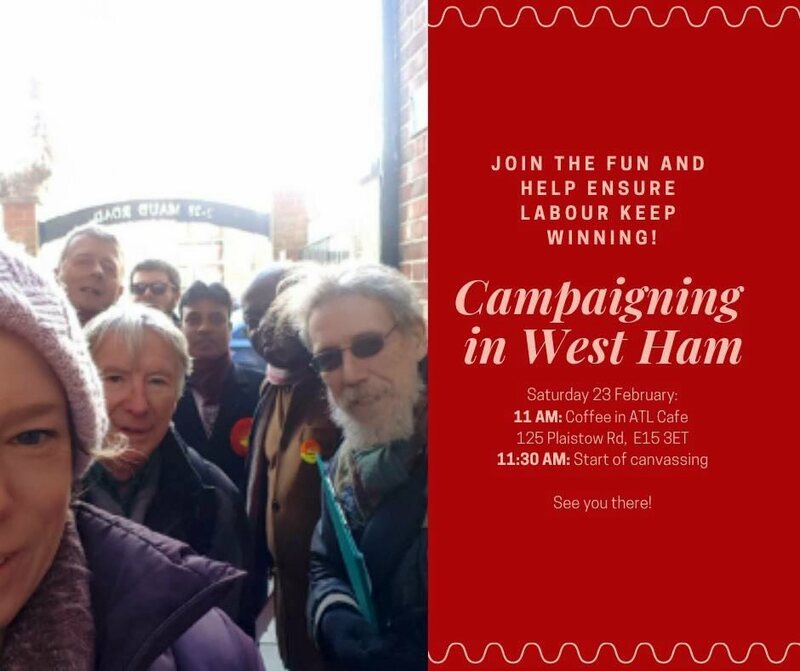 I love the picture (lower middle) where we are singing protest songs but Joshua, the young son of Newham Councillors, Carleene & Daniel Lee-Phakoe, is pictured sticking his fingers in his ears at our noise, therefore making his own protest. 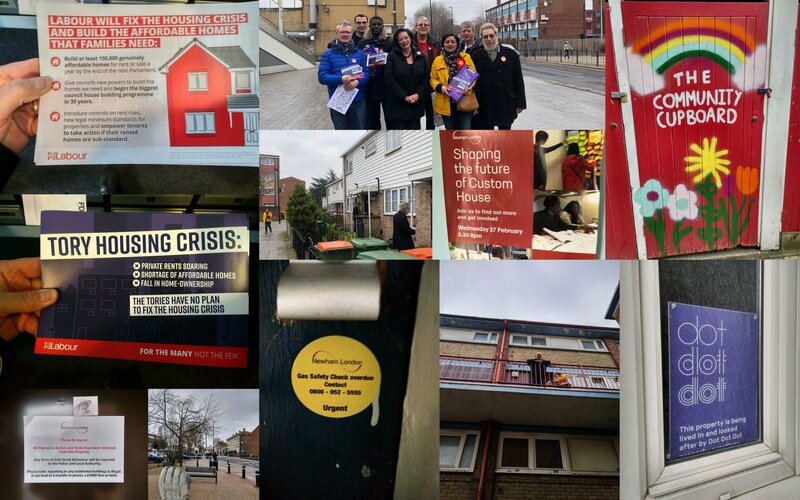 Picture Collage from last week's campaign day in Custom House talking to residents about bread and butter housing issues as well as regeneration and crime. I am really pleased that Sarah has agreed to be our Keynote speaker at our branch AGM on March 12 at Portcullis House. She is a local London MP and a Shadow Housing minister. Before the meeting we will have a tour for members and their guests of the Great Hall and the House of Commons (many thanks to my Newham colleague, Julianne Marriott who has "volunteered" to lead on this tour - she is a qualified blue badge tourist guide) and after the meeting a branch meal and social at a nearby restaurant. 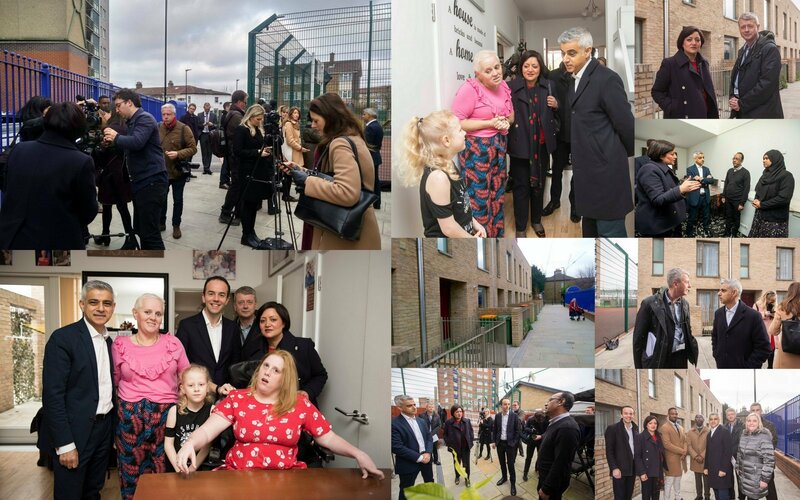 Picture collage from yesterday's visit in East Ham with London Mayor Sadiq Khan and Newham Mayor, Rokhsana Fiaz, to new Council owned homes. The large number of TV and other media present showed how housing is now becoming a number one political issue. The families who proudly showed us around their new homes were absolutely brilliant ambassadors for council housing. 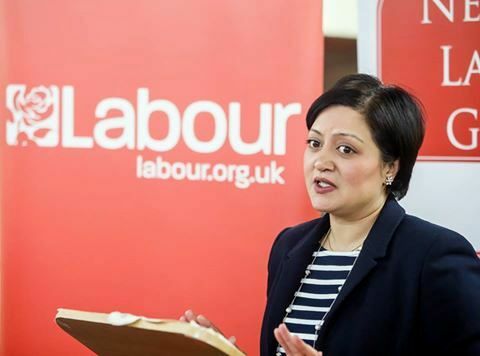 Thanks to London Mayor, Sadiq Khan's £107 Million investment, our Newham Mayor, Rokhsana Fiaz, will now be able to build at least 1000 similar council homes at a social rent. Not only will this mean that at least a 1000 Newham families will in the future have access to decent, secure and truly affordable homes, the lovely family we visited with the disabled adult daughter will also benefit when we pay care workers a London Living wage and sign the UNISON Ethical Care charter. Carers will not only receive sick pay, training and up to a £100 per week pay rise but this will result in less "turnover" of carers. Which is a major issue. As part of our Newham Mayoral anti poverty programme, the 50% reduction in Council tax for the 19,000 poorest households in Newham, will be transformational for our most vulnerable residents. This should be interesting. 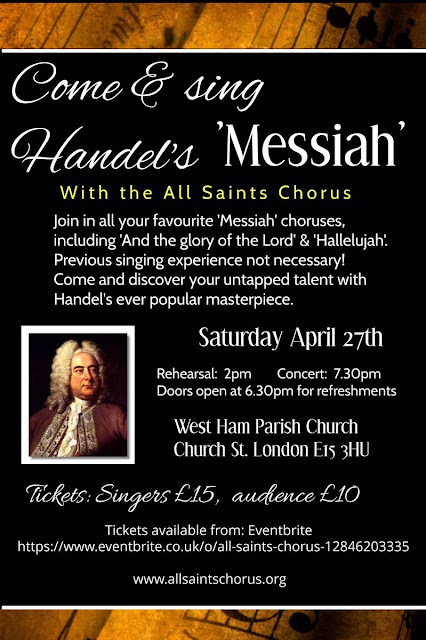 I have a clash with LBN cabinet but will hope to come to this event afterwards. This is what we want to do in Newham! "With Tory austerity blighting our communities and forcing councils to cut and privatise many local services, there is an urgent need for Labour councils to come together to develop and share ways to bring services back in house, stimulate local economies to provide decent jobs, and strengthen local democracy. There are many creative solutions being used already, and we have set up the Community Wealth Building Unit to spread this inspiring work through online resources, regular workshops and training sessions for Labour councillors, and bespoke advice and practical support. 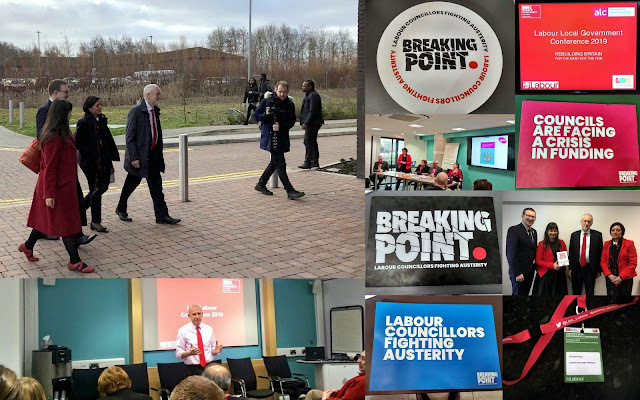 The Unit brings together councillors, unions, think tanks, and independent experts with experience of delivering frontline change and adopting creative methods to secure and provide vital services and stimulate sustainable economic development for communities in the face of austerity. I was privileged to be re-elected last week at the London UNISON Regional Council AGM as Finance convenor (Treasurer and Regional Council Officer) for I think the 12th year in a row. 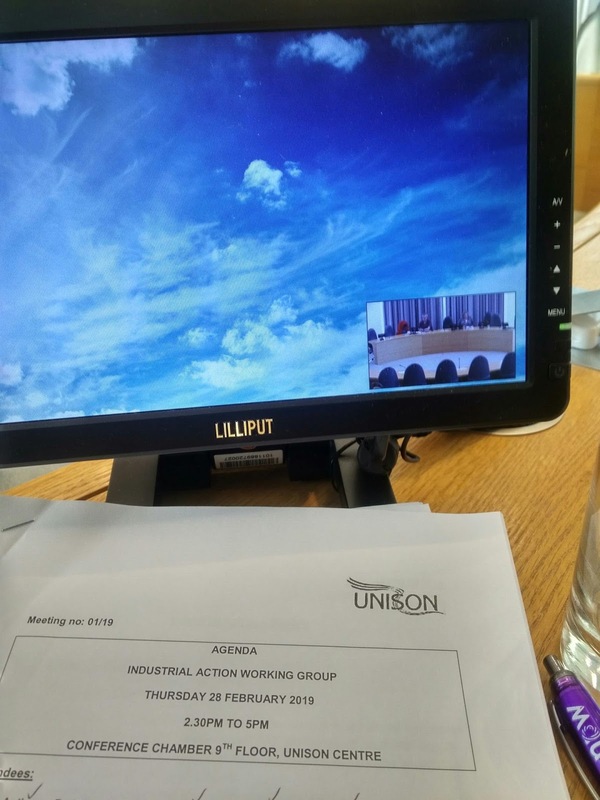 The AGM was probably in my view the most constructive and positive one, I have ever been to in all my years as a UNISON activist. The UNISON Lay President, Gordon McKay (a NHS nurse), gave a typical self deprecating but very passionate keynote speech about the simple cruelty that this Tory Government shows towards the poor and the vulnerable. 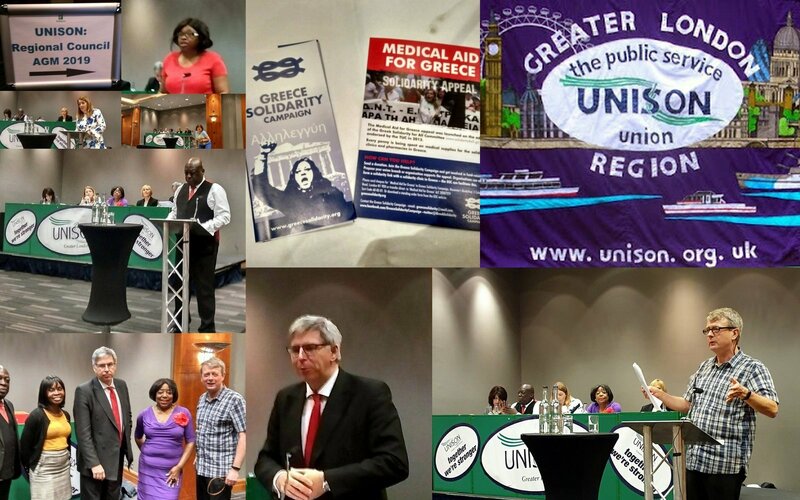 Next a great presentation by http://greecesolidarity.org/ about the work they do to support the people of Greece and a plea for support from UNISON branches. I gave my financial report to the AGM and was pleased that there were proper questions and challenges by delegates. Deputy Convenor, Conroy Lawrence, who was also re-elected had nearly everyone in tears as he moved his branch's motion on Gun and Knife crime, and told us why this is so important to him as he explained about the senseless gun murder of his own son. Branch activist, Misty Harmon-Russell also spoke during the debates. Our Convenor, Yvonne Green, was re-elected unopposed and showed why, by her lovely polite, quietly spoken but firm chairing of the meeting. This is a real skill. Looks good. Despite being Welsh I am afraid that my singing gene is somewhat missing. 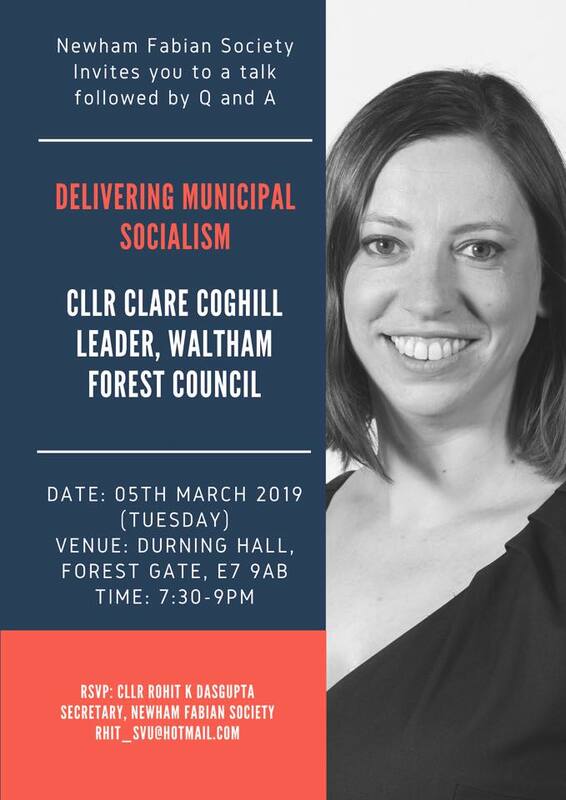 Taking place in the best ward in Newham of course. At the start of conference, local Cllr Jackie Taylor welcomed us. LGA Group leader, Nick Forbes, reminded everyone that we are are a Labour movement family with the odd wayward teenagers & grumpy uncles (I plead innocence). There were a number of seminars and fringes including an important one on "New municipalism community wealth building" and another with John Healey MP on housing campaigning. Where following negative comments about the problems caused by Airbnb in some areas, I had to admit to staying in a flat for this weekend via this said website. I am so pleased that Labour has committed to getting rid of section 21 (no fault legal evictions). We also need to support the Tenants/leaseholders representative movement, since we will never get first class housing services without this. Rokhsana also skyped into two Newham Citizen assemblies that were being held in East Ham town hall at the same time. I filmed her on her phone as she addressed the morning and afternoon assemblies. It is amazing what modern technology can achieve. "Newham’s left wing Mayor challenges Tory austerity in her first budget"
Hat tip "Labour Against Austerity"
"The Mayor [of Newham] has set out a clear ambition for housing in Newham, with a particular focus on increasing social housing stock in the borough. That is the introductory paragraph of a paper at the December 2018 meeting of Newham’s Cabinet, approving a business plan for Newham’s “Housing Revenue Account” – the obligation to account separately for Council-owned social housing. Its technical material, and language quoted is a little dry, but perhaps it illustrates best the political change emerging from the replacement of Sir Robin Wales as Mayor in May 2018 with Rokhsana Fiaz. The February 2019 budget is new Mayor’s first budget. She and her cabinet colleagues regularly tout this as a ‘transitional’ budget, clearly frustrated it doesn’t in itself demonstrate the sum of the political ambition, but marks a significant change of direction. A more radical, transformative 2nd budget is to be prepared over the next twelve months. In reality, the housing aspects of this first budget are already radical and transformational. The fact that the “Housing Revenue Account” business plan is being transformed, is a demonstration of the role of actual council housing in the new Mayor’s priorities, both in terms of investment by building new council housing, and in investment in existing stock, improving the housing of existing tenants in their current homes. The London Borough of Newham is recovering from a scandal in its “Repairs and Maintenance Service”, which was exposed by the actions of a whistleblower in the last months of the Robin Wales administration. The service had been re-modelled to be prepared for commercialisation and was expected to behave like a business – and so commissioned to work on the Borough’s highways maintenance, but without a proper system of checks and controls. Millions of pounds were lost. This became more widely known through the publication of a report by the Chartered Institute of Public Finance and Accountancy (CIPFA), commissioned by Rokhsana Fiaz immediately on taking office. The practical reality for residents in Newham’s council housing is the repairs and maintenance service is much more about repairs and much less about maintenance. The first budget of the new Mayor effectively doubles asset investment in existing council housing, to £65 million in 2019/20. The detailed capital programme identifies work on lifts, boiler replacements, kitchens, bathrooms, windows, roofs, door entry systems and much more. The CIPFA report criticised a poor balance of planned and reactive maintenance, and so the capital programme should now stop leakage of public money through inefficient reactive spend. Meanwhile millions are allocated to find new council homes for Newham’s staggering waiting list. £28 million is allocated for acquisitions, including where sensible, Right-to-buy buy-backs. £82 million is allocated to the council building its own new build homes. Much of this funding comes from £107 million Sadiq Khan granted to London Borough of Newham as part of Khan’s Building Council Homes for Londoners programme – the largest allocation to any London Borough. 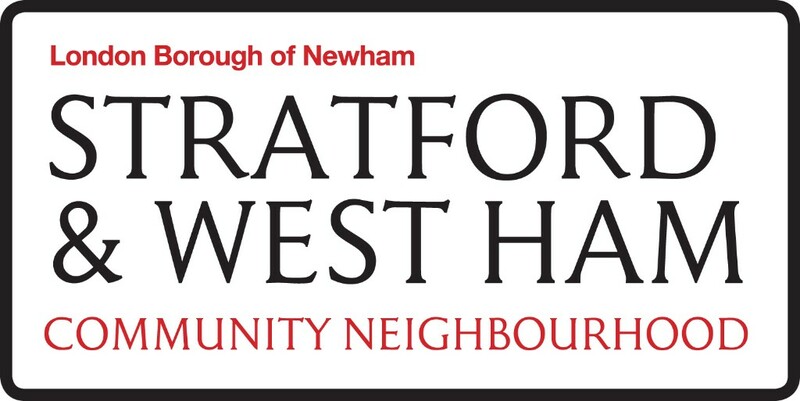 The Affordable Homes for Newham Programme was agreed on 5 February 2019 and will “seek approval for new build and acquisition programmes at the earliest opportunity”. The budget sets aside £500,000 to fund 26 full time equivalent professional staff to work on the Affordable Homes for Newham Programme. The HRA business plan, the GLA funding and the Affordable Homes for Newham Programme all demonstrate Rokhsana Fiaz is likely to exceed her election pledge to deliver 1000 new homes at council rent levels. Meanwhile this ‘transitional’ budget is radically investing in children and young people. £1.2 million extra has been budgeted to guarantee the universality of Newham’s free school meals programme “Eat for Free” for Key Stage 2 pupils; £1.4 million is for additional youth services; £1.3 million for Special Educational Needs and Disabilities. 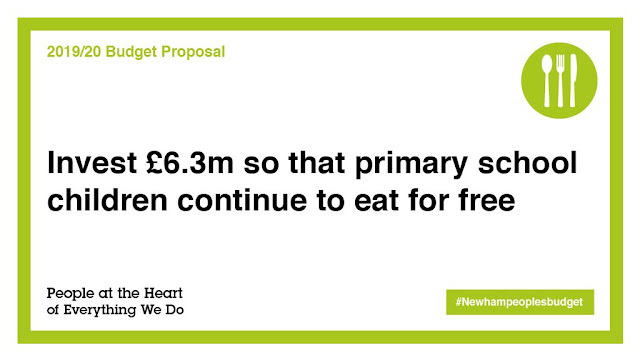 Separately £3 million is allocated to work on Newham’s accreditation as a London Living Wage employer. The investment prioritised by the new Mayor is all the more remarkable given the general financial situation for Newham, as across local government; continued austerity imposed by central government further decreases government support for poverty stricken areas like Newham; Lyn Brown MP made a brilliant speech to this effect in parliament a few days ago and the challenges for local government are enormous. This year savings are coming from, amongst other things, fewer editions of Robin Wales’ vanity Newham Mag, previously published monthly; ending Robin Wales’ “Small Business Programme”; and more effective and active asset management. Council Tax rises by less than inflation, and for those eligible, the Council Tax Reduction Scheme cuts their Council Tax by half. Savings of £686,000 to Robin Wales’ “Every Child a Musician” programme have caused controversy, but the programme itself is controversial, regarded as a well-intentioned but inefficient and ineffective programme by various educational and music professionals. 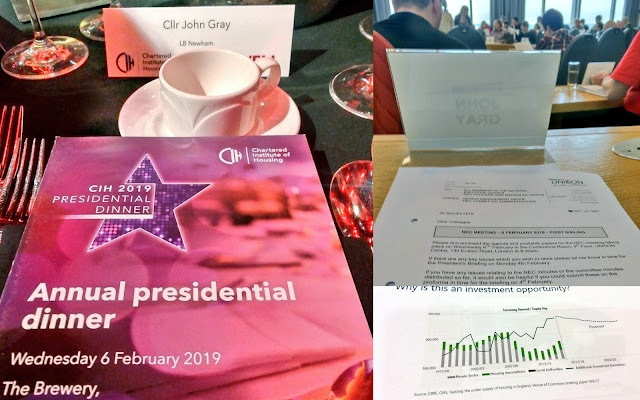 The Chartered Institute for Public Finance and Accounting noted poor budget planning at Newham generally, but specifically cited Every Child for where previous expenditure increases had lacked budgetary oversight, and further overspends took place that were, in CIPFA’s view, unsustainable. CIPFA recommended the programme needed to be “re-evaluated” and the Council has pledged to do so. It proposes months of engagement on establishing a new more “ambitious creative and cultural enrichment programme” that will be available to all Newham children and which will serve the diverse cultural interests of Newham children. Meanwhile millions of pounds are allocated for additional support and preventive work on homelessness and rough sleeping, on democratically regenerating the Carpenters Estate and more generally demonstrating that Labour in local government is no longer aligned to the era of New Labour and is demonstrating how in Jeremy Corbyn’s Labour Party, Labour in office can actually deliver for its people. * All figures relates to 2019-20 unless otherwise stated. 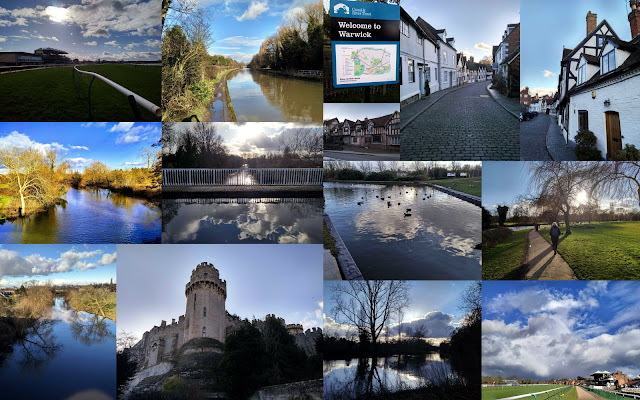 The canal, the river walk and views of Warwick castle were simply stunning. The winter sunshine obviously helped. 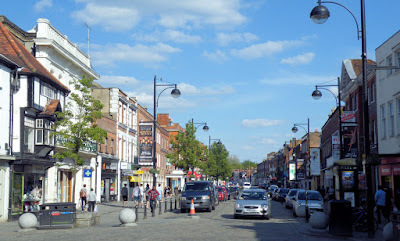 A overnight return visit to Warwick is definitely on the cards. "Invest £6.3m so that primary school children continue to eat for free"
"Men's mental health at work: how unions can help men to open up"
Great post on TUC website. I did not realise that today was "time to talk day". "It’s a bit of a cliché - the strong and silent man, the stiff upper lip. But sometimes clichés are clichés because they contain a truth. The truth here is that men often don’t talk about their mental health, or indeed their feelings at all. I was first diagnosed with clinical depression in my mid-teens. I was diagnosed with Generalised Anxiety Disorder a few years later. I was 18 when I first attempted suicide. I’m now 53 and my second (and hopefully last) attempt was four years ago. In the intervening years I’ve experienced good mental health and bad mental health. I’ve had periods when I’ve been really on top of my life, and times when I could barely function. But one thing that defined most of those years was my inability to talk to another human being (who wasn’t my GP) about my mental health. Currently, the biggest killer of men between the ages of 18 and 45 in the UK is suicide. There is a national crisis of mental health, yet men are far less likely than women to seek help for their mental health issues. Only 53% of men who have depression have spoken to a friend about their illness, as opposed to 75% of women. For as long as I can remember, people have told me to ‘man up’ when I’ve seemed low. Once you reach a certain age, the perfectly natural act of crying to release emotions becomes a problem for boys. If you cry, you’re seen as weak, effeminate or odd. So you just stuff it all back down inside, wear a mask and act like ‘one of the lads’. Both my suicide attempts happened not because I didn’t want to live anymore, but because I was so full of unexpressed emotions, I felt like I was going to explode. Men also face self-image problems which I believe are being exacerbated by social media. The constant pressure to have the perfect body is no longer just something women experience. NHS figures show that over the last decade male hospital admissions for eating disorders have risen by 70%. This is not to detract from women’s experiences of mental ill health; women are far more likely to be diagnosed with an anxiety disorder than men, and cuts to mental health services have disproportionately affected women. However, I believe there is still an urgent discussion to be had in the trade union movement about men’s mental health. The question is, what needs to be done? Firstly, there is an urgent need to de-stigmatise talking about mental health for men. 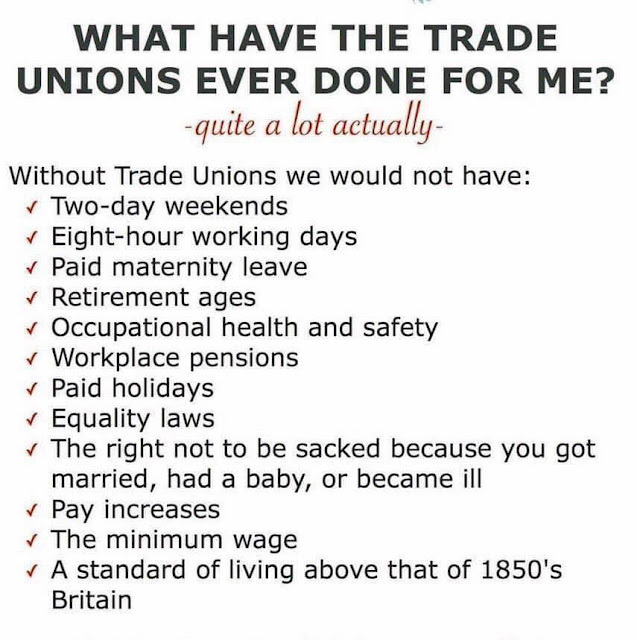 The Campaign against Living Miserably (CALM) and Heads Together have done good work in this area, but I would argue that trade unions could add to this substantially by creating discussions in the workplaces we represent. Unions can play a role in helping employers set up networks of Mental Health Champions or First Aiders. Crucially though, we can also negotiate strong and effective mental health policies that help men (and women) talk about their issues without fear of judgement. We must also continue to campaign for a fully funded NHS and mental health services that provide the support, treatment and space to talk that is so desperately needed to tackle the mental health crisis in this country. Four years ago, I took the decision to be open about my mental health issues. I was terrified. Unsure if I was making the right choice. But I knew that carrying on as before would eventually kill me. So I started talking to friends, family and my employer. I wanted them to see that it’s ok for men to talk openly about how they feel. To paraphase Gandhi, I became the change I wanted to see. This decision was the starting point of my recovery. I now have a support network that gets me through the days when I feel that I can’t cope as well, and I have an employer that genuinely helps and supports me. What I want most of all, is for everyone to feel able to be more open about their mental health. Today is Time to Talk Day, so it’s as good a day as any to start doing something. Every trade union activist, rep, officer, even members should use this day to ask :what is my union doing to help men and women talk about and get support on mental health? And what can I do to help? Many unions are running courses and events that help reps understand the impact poor mental health can have on people’s lives, including what workplace initiatives can be developed to bring about healthier and safer workplaces. But small things matter – such as making the time to really talk to your workmates. And above all, not using the old clichés such as ‘Man Up’. 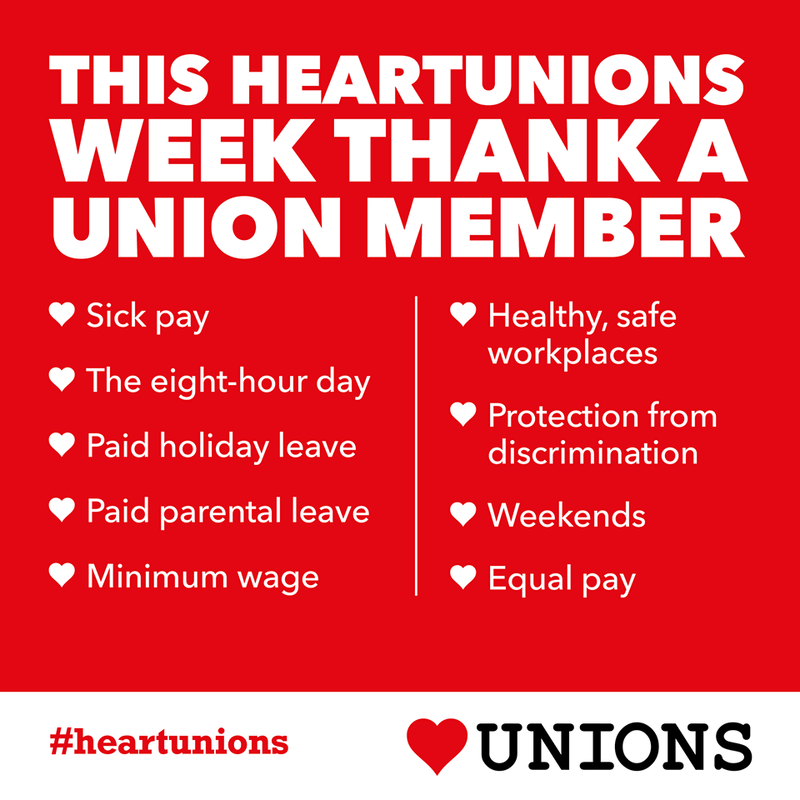 Mark Everden – Regional Organiser (Education) Unison South West. Off message but picture collage from a local winters walk yesterday from Forest Gate to Wanstead and back. It was cold but lots of sunshine and blue skies. We stopped off to feed the birds at Jubilee Pond with defrosted green peas (bread makes their stomachs swell apparently but no-one has told the birds this since they were far more interested in bread than our peas). We then walked through Bush Wood and along Overton Drive, then cut through to George Green. We checked out the Farmers Market in Wanstead and bought some Cromer Crab and a Joint for Sunday dinner. 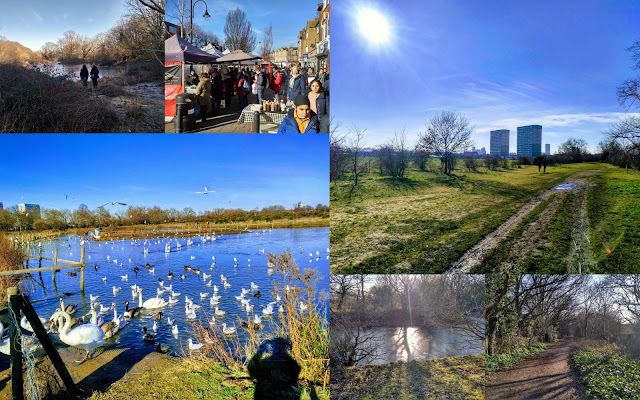 After a bite to eat at Filika Restaurant (great set lunch for £8.95) we walked back home via Wanstead Park. Lovely little walk just under 5 miles. For the whole day I had 127 Google Fit movement minutes and 90 heart points. 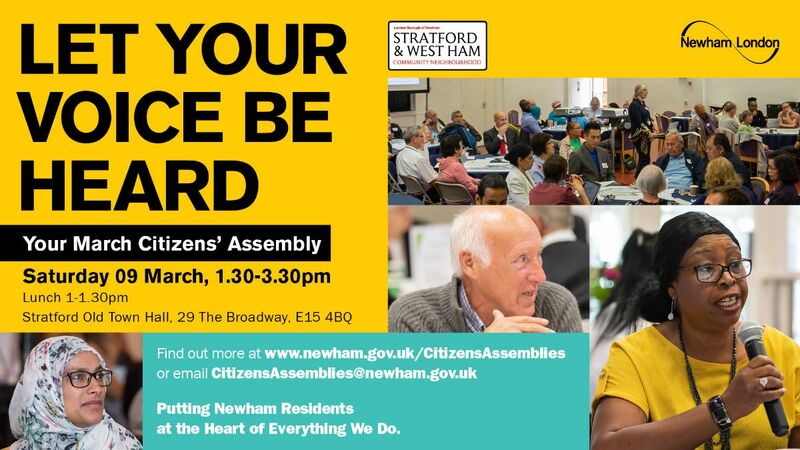 In the third and final round of the 2018/19 Citizens’ Assemblies residents will have an opportunity to comment and refine their Local Community Plan that has been developed through the assembly process and by the working group members, local councillors, council officers and partners. Residents will also have an opportunity to vote on projects that will be incorporated into the Local Community Plans. Excellent article by my Scottish UNISON NEC Colleague, Stephen Smellie in yesterday's Morning Star. While the Local Government Pension Scheme (LGPS) is slightly different in Scotland than England and Wales (stronger trade union rights for example), I would support pretty much all his points for south of the border. WOULD you give your boss 20 per cent of your wages every pay day to look after for you? Would you be happy for them to use that money to speculate on the stock exchange, putting your money into arming dodgy regimes, harming the health of children and destroying virgin forests in the Amazon? Sounds like some dodgy racket but that is what many workers who are in occupational pension schemes do every pay day. In the Scottish Local Government Pension Scheme, which I am a member of, between 5 and 8 per cent of our wages goes into our pension fund. The council employers put in between 13 and 20 per cent of the value of our wages. Both the employee and employer contributions are deferred wages that otherwise should be in our wage each month. The money goes to the pension fund which is managed by a pension fund manager overseen by a committee of councillors and shadowed by a pension board made up of employers’ representatives and trade union nominees. The pension fund manager, in the vast majority of cases, commissions external investment managers to invest my deferred wages with the intent of making a profit so that when I retire I will have a healthy pension. These external investors take a commission on every bundle of millions they are asked to “look after” and a further commission on every transaction they undertake with my pension pot and rarely actually reveal how much all this management of my deferred wages is costing the pension fund, that is, costing me, who hasn’t had a decent pay rise in many years, and my cash-strapped council employer. Now that does sound like a dodgy racket. I have no say over where the investments go. Currently they go to buy shares in companies that are investing in fracking and the destruction of indigenous people’s homes in the Amazon to allow access to climate destroying coal reserves; making money out of companies supporting the illegal occupation of Palestinian land; tobacco companies that market their product to children in the developing world. While most investments are in less dubious areas of capitalist speculation, including a relatively small amount in infrastructure, renewable energy and social housing, it is still true that millions are in highly unethical investments and that I, as a pension fund member, have no say in this. Fortunately, thanks to the efforts of trade unions, led by my own union Unison, and allies in civic society campaigning around ethical investments, this is beginning to change. Pension fund managers, some very unwillingly, are being forced to address these issues. The advent, in the past few years, of trade union members on pension fund boards has allowed for challenges to be made to the previous arrangements where pension managers were given almost free rein to do what they wanted as the council committees nodded through annual reports that were opaque. After years of campaigning the trade unions have secured agreements that pension funds will only engage external managers who agree to sign and adhere to a transparency code which requires them to give a full account of all the costs that they are charging to the pension funds. This will allow pension funds to compare the costs they are being charged with what other funds are charged. Remarkably, and predictably, this has led reductions in the fees being charged to pension funds. The trade union reps are leading in questioning where pension funds are invested. Unison, supported by a number of environmental campaign groups, launched a campaign last year for disinvestment from fossil fuels. Millions are invested in companies that continue to trade on the exploitation of more and more fossil fuels when government policy across the world is moving away from the high-carbon economies and accepting that fossil resources should mostly be left in the ground. Investments in fossil fuels is not only encouraging more damage to our climate but also risks our pension funds being left with “stranded assets” as the value of these companies declines as the world moves to a low-carbon economy. In Scotland, Unison is launching a campaign to argue that the 11 local government pension funds, run by 11 different managers and supervised by 11 different committees and boards, should be merged into one Scottish fund. This would create a significant fund that would be able to make huge savings in the cost of the external investment management. Instead of 11 funds employing the same companies and all being charged separately there would be one contract negotiated and subject to the most transparent accountability. A Scottish fund would have the advantage of larger sums to invest, making it a major player, able to get better investment returns and have greater influence over ethical investments. There would be greater potential to invest in infrastructure projects that can provide benefits to the community as well as good returns for the pension fund members. Importantly it would also mean that greater use of in-house investment managers rather than relying on the external Maserati-driving investment managers who profit at our expense. In-house teams in Lothians and elsewhere have proved successful and cheaper and all of Scotland should be able to benefit from this. Research shows that hundreds of millions of improved returns and savings in costs could be achieved if the 11 Scottish funds were merged. That is hundreds of millions of pounds that could both improve the pensions of local government workers and reduce the costs to the employers, and ultimately the council tax payers, of pension contributions. Savings that could then be used for better pay rises and protecting local services. Unison will be targeting Scottish Finance Secretary Derek Mackay who is considering options for the pension funds. One fund makes sense and we hope to persuade him that one fund is the best option. Trade unions have in the past only got active around pensions when proposals to increase members’ contributions or cut benefits have been proposed. That is changing. Pensions are our deferred wages and we are entitled to have a say in how they are managed for our future. 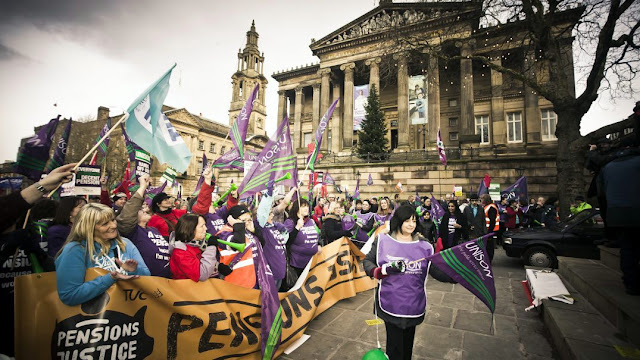 Unison and our sister unions are leading a movement for decent, sustainable and ethical pensions. These are our pensions. Why shouldn’t we have greater control over them? Stephen Smellie is deputy convener of Unison Scotland. 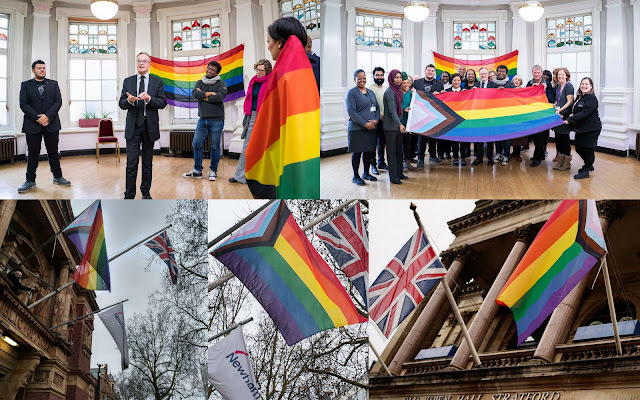 "Newham Council raised new Progress Rainbow flags at its Town Halls in East Ham and Stratford today (Fri 1 Feb) to celebrate February as LGBT History Month. The new Progress Rainbow flags incorporate the well-known rainbow design but additionally now represent trans, black, and ethnic minority communities. See the full programme on our website: https://www.newham.gov.uk/…/Services/LGBT-History-Month.aspx"